When it comes to the dangers of EMF radiation, smart meters are on the top of people’s list of concerns, and for good reason. Smart meters are the modern version of analog utility meters, that utilize wireless data transmission to pass information to utility companies. This saves the utility companies money but exposes homeowners to enormous amounts of EMF radiation. While there are some steps we can take try and get these meters removed, one of the best things we can do is get a smart meter shield to protect our homes from this radiation. In this article, I want to talk about what smart meters are, why they are dangerous, how you can shield yourself from them, and how you can make your own DIY smart meter shield. Smart Meter Shields? What Even Is A Smart Meter? Remember when you were younger and some employee from the electrical company would hop your back fence to see how much electricity you had used by looking at your meter? They had to do that because that was the only way to get that information and bill you correctly. The problem was that this was costly, as they had to employ thousands of people to get these meter readings. The term “Smart Meter” is what you will often see, however this actually just one brand of what is called Advanced Metering Interface meters, or AMI. These meters are capable of passing communication both ways. This allows the utility companies to collect data in real-time about how much electricity you are using, what devices are using that electricity, etc. These meters also accept information, meaning the utility companies can do things like turn off your electricity or gas remotely, update the unit’s firmware, etc. Although some people still have the old style analog meters, they are becoming increasingly rare. 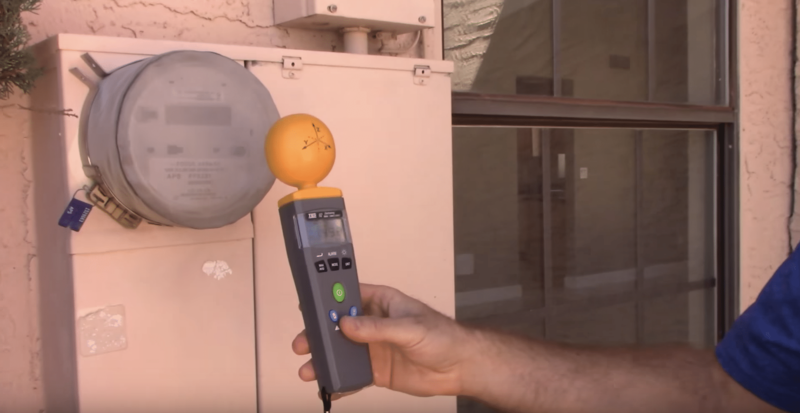 Almost 100% of new construction in the united states is installing these AMI meters by default, and it is estimated that within the next 5 years less than 5% of homes will have analog meters still installed. Let’s talk a little bit about this. Your smart meter is just one small hub of a large network that allows for fast and efficient transmissions of utility data. Typically, your meter will send it’s data to an antenna in your neighborhood, which will then be transmitted on to a nearby tower, and ultimately to your utility company. This data is transferred via radio frequency, a form of electromagnetic frequency radiation. Whenever you are measuring radio frequency radiation, you’ll notice that it happens in short spikes and surges. These spikes are actually just large packets of data being transferred. When you measure your cell phone or home router you’ll experience the same thing. The primary problem is that Smart Meters emit such an enormous amount of radiation, that is capable of penetrating the walls of your home and impacting your health. These transmissions happen 24 hours a day. Take a look at the video below to get a visual example of this pulsing radio frequency radiation. If you call your utility company and ask them about this radiation, they’ll likely give you a pre-written statement about how the radiation is “non-ionizing” and so it is not dangerous. I can assure you that this is not the truth. Our body makes over 2 million new red blood cells every second. This rapid creation of new cells leaves them vulnerable to stresses on the body. Inside of our red blood cells, there is actually a series of small receptors, located within the cell membrane. Although these receptors typically receive chemical signals from the body, they are also capable of being influenced by outside influence. These receptors can actually sense man-made EMF radiation, and they react as if a foreign invader is entering the body and the bloodstream. Reduces the number of healthy nutrients that enter our cells. Inhibits our cells ability to interpret and rid themselves of toxins and free radicals. With that said, it should be fairly easy to understand why large spikes of radio frequency radiation entering your home should be a significant concern. How Does Smart Meter Radiation Compare To Cell Phone Radiation? Both cell phones and smart meters use radio frequency transmissions to send data to cell towers. Smart meters emit far more radiation, but this radiation is usually farther away, so it’s a bit tough to say which one is worse. If you’ve read my post “17 Ways To Reduce Phone Radiation,” you probably have a pretty good understanding of how much radiation phones emit, and what you can do about it. You also read that one of the primary reasons cell phone radiation is so dangerous is the proximity to our body. With most people holding their smartphones directly against their heads, they are exposing themselves to an enormous amount of radiation. Even holding your phone a few inches away will reduce that risk significantly. So when it comes to Smart Meters, we don’t have the issue of it being so close to our bodies, however, it emits radiation at far higher levels. In fact, a researcher at the University of California, Santa Crus named Daniel Hirsch, wrote a report that states smart meters emit radiation levels up to 160 times greater than cell phones. It could be because of the excessive radiation exposure from your Smart Meter. There are a few things we want to know before we look into shielding, and the first is finding out if we indeed have a smart meter, as the utility companies are getting very deceptive with this. Although some meters will, in fact, say “Smart Meter” right on it, which is a brand, they won’t all be this obvious. 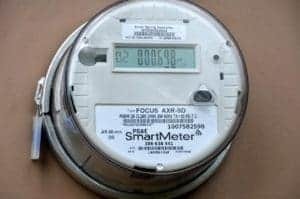 Many smart meters are actually specifically designed to look like analog meters, with a mechanical spinning wheel, but are in fact transmitting data wirelessly. Other meters are in fact analog meters but have been retrofitted with a wireless transmission board, and without seeing them install it you would hardly know. Probably the best way to know for sure if you have a smart meter is by getting a quality EMF meter that reads Radio Frequency radiation (be sure it does, not all EMF meters detect this). Personally, I use the TriField TF2 (read my review) and absolutely love it. If this is the EMF meter that you have, simply flip the black switch all the way to the right where it says “Radio Frequency.” Remember to not look at the large number in the center, but instead the peak number in the upper left corner. The reason for this is that RF is sent in packets, and is not transmitted all the time. If you are seeing large spikes in radio frequency on your EMF meter at distinct intervals, you have a Smart Meter installed. Ok, so you have a smart meter what now? As a continuation of the last step, the first thing you need to do is get a general reading of how much radiation the meter is producing. Just like you did to determine if you have a Smart Meter, hold your EMF meter about a foot away for a few meetings, and take note of the spikes. At the end of a few minutes, average out the spikes to get a general number for how much RF radiation the device is emitting. 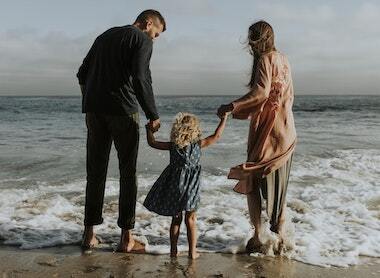 If you’re unable to opt-out of having a Smart Meter (check out this post for more information on that), then the next best thing you can do is shield your home from the radiation. Luckily there are a few companies that make devices for exactly that reason. My favorite by far is a company called Smart Meter Covers. There is another popular company called Smart Meter Guards, but they produce the exact same product and charge double the price, which is why I always recommend smartmetercovers.com when people ask. What Exactly Is A Smart Meter Cover (or Shield)? A Smart Meter shield is essentially a small faraday cage that blocks all, or the vast majority of, EMF radiation. 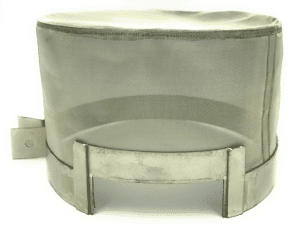 You can see from the image that these covers are specifically designed to fit cleanly over a smart meter, with a single bolt that tightens the devices to keep it on. They typically lower EMF radiation exposure by about 98%. Take a look at the video below from Smart Meter Covers showing a before and after measurement with the Smart Meter Cover. You can see from the video just how easy these are to install, and how they immediately reduce the EMF radiation. In the video they take measurements inside the home as well, pointing out that the grounded metal from the box blocks the majority of radiation from getting into the home. While I certainly believe this is the case in this video, this has not been my experience with all homes. Sometimes the readings inside the home are nearly as high as measurements taken outside, for that reason I’m going to talk a little bit about how you can protect the inside of your home as well. Ok, now let’s talk a little bit about how to install it and be sure your home is protected. Install Smart Meter Shield – First, take your Smart Meter Cover and install it on your Smart Meter. After it’s installed go ahead and get a new measurement and see how it compares to the average of the spikes you wrote down earlier. Assuming you see dramatically lower readings, it’s time to check inside your house. Go ahead and go inside to the wall opposite your smart meter, and with your EMF meter, get a reading. If it is relatively high (anywhere close to the unshielded average you took) go ahead and continue on to steps 2 and 3. EMF Protection Paint – (See my review here) One way you can protect the inside of your home is with EMF protection paint. This kind of paint block EMF radiation that is coming in a direct line, so it makes a perfect product to block radiation coming from a smart meter into your home. Make sure you check out my review or look it up yourself so that you are sure to apply and ground the paint properly. – (Get the product here)This can be used in place of the EMF protection paint and is a really cool product. 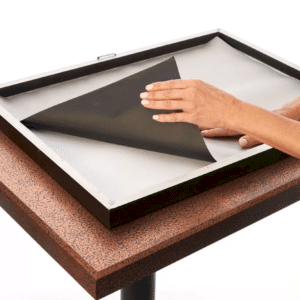 It is essentially a simple liner that blocks EMF radiation, that can be put in any frame. This allows you to frame a picture, or poster or just about anything, and then hang that up on the wall you share with your smart meter to block the radiation. This is likely not to be quite as thorough since you can’t easily cover as large of an area, but it is much simpler and cheaper than the EMF protection paint. Ok, now that we’ve talked about what the best Smart Meter Shield is, and how to install it, let’s talk about a few ways that you can make your own DIY smart meter shield. There are a few ways you can make your own Smart Meter Shield to protect your home. Essentially your goal is just to cover the entirety of the meter (or at a minimum, the sides of the glass dome) with a material that blocks radio frequency. Note: It is important that you do not tamper with the meter itself. Do not break the glass, or attempt to alter the meter in any way, as this is extremely dangerous. The first option I really like is using Reflectix and Aluminum Foil Tape to make a simple DIY smart meter shield (these can also make great gifts!). Measure the circumference of the smart meter, as well as the depth. Cut a piece of Reflectix so that the length is your circumference plus 1/2″, and the width is 8 inches. Bend the piece of Reflectix you purchased into a circle, put the edges together, and seal them with a piece of your aluminum foil tape. Now squish the cylinder together, so you have the sealed edge on one side. On the opposite side, cut a small slit. Now, squish together the other side of the cylinder, and make two more small slits with the scissors. When you’re done, you should have 3 slits, as well as the sealed edge, all equidistant from each other. Now fold each of these sections over, and seal them with a piece of your aluminum tape. Now just open up the un-sealed end and re-shape it so it’s a nice circle, this is the part that will go over the meter. Take a look at the video below for a step-by-step guide on making this meter. As you can see from the video, this simple DIY smart meter shield will block about 90% of RF radiation from your home. This second option is even less expensive than the first and is very quick and simple (Thanks to Branden Simoens for the idea). You’ll only need three things for this, Aluminum Foil, Aluminum Screening, and either a hose tie or a zip tie to keep it all together. Start by wrapping aluminum foil around the sides of the smart meter, this will keep any radiation from coming out the sides. Then wrap the entire glass dome in aluminum mesh. Finally, seel it all together with a hose clamp or zip tie to keep it in place. For a visual on what this looks like, take a look at Branden’s video below. It’s important to remember that no matter how you choose to shield your smart meter, either by purchasing a Smart Meter Cover, or doing it yourself, that you take measurements before and after. Without doing this, you won’t be sure that you did a proper job of protecting your home. 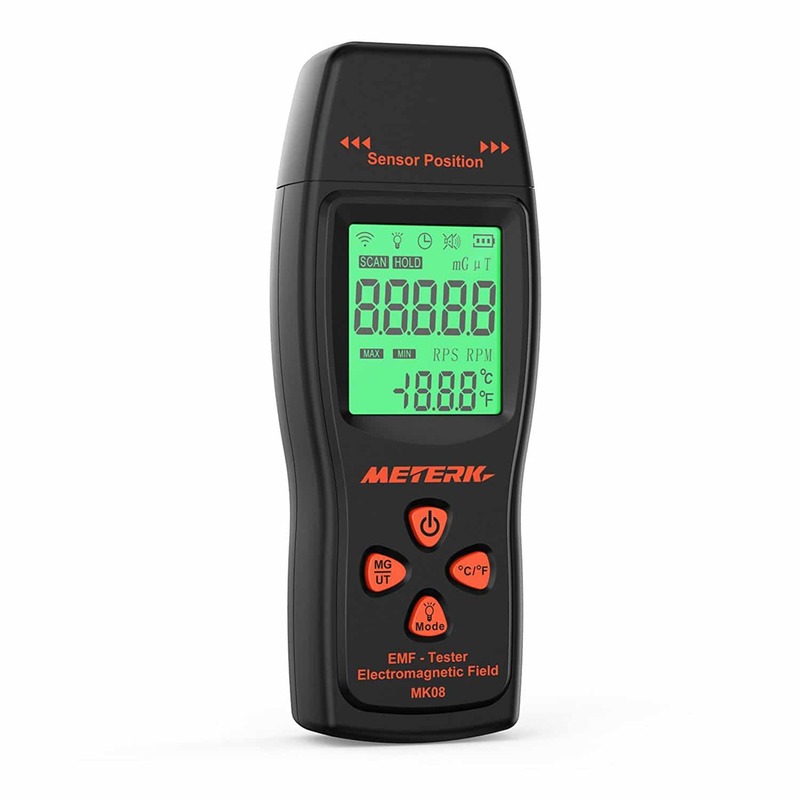 Having an EMF meter is also extremely useful for gaining an understanding of the type of, and how much, radiation is being emitted from devices in your home. Smart Meter’s are one of the most invasive and dangerous culprits when it comes to exposure to EMF radiation. Remember that we have a chose over many of the ways we expose ourselves to EMFs, like using cell phones, tablets, laptops, etc. However, for the majority of people, the utility company is making this choice for you, exposing you to excessive radiation primarily so they can save money. Your state allows you to opt out – but you may be required to pay the utility company an additional fee to help compensate them for sending out an employee. Your state allows you to opt out and utility companies are not allowed to charge you an extra fee. So be sure to look into the law for your state, and then call your utility company to see if you are able to opt out. For more information on this see my guide to smart meters. I really hope you found my guide to Smart Meter Shields helpful, if you did, please consider sharing it! So when you shield the meter, doesn’t it prevent the utility company from receiving adequate readings? And then what? Do they charge you for having to send a man out to read the meter? Or do they order you to remove the shield? The utility companies should still get the signal they need with the Smart Meter Cover installed. Smart meters are made to transmit many miles so they make them with fairly high RF power. The Smart Meter Cover blocks about 98% of the RF (radio frequency) radiation emitted from the smart meter. The remaining RF signal that leaks out is typically enough for the utility company to still get the signal.